A secure purchase through PayPal or credit card. WINDOWS: Japan and the U.S. 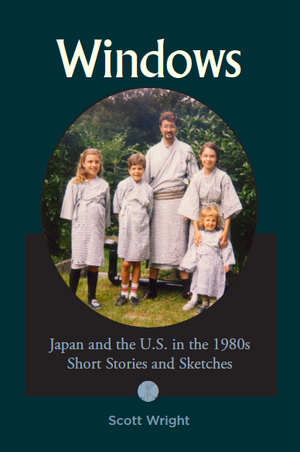 Here is a collection of short stories and sketches comparing and contrasting the rapidly changing culture of the United States with Japan’s stable, established traditions and society in the post-WWII decades. The fictionalized stories in the first section are coming-of-age stories about young men trying to find their way when their lives aren’t what they thought they would be, or should be, including the realization of changing values among generations. The second section is comprised of sketches written through the eyes of a young Midwestern professor who, awarded a Fulbright grant in 1979, moves his young family to Japan, and experiences the sights, sounds, and especially the societal differences between the two countries. The majority of stories in the third section are based on real events that occurred in Japan during the author’s years there, many of them suggesting that beneath the formal façade of Japanese society, deeper tensions exist, especially in the areas of marriage and the role of women. The diverse works in this collection are sometimes humorous, often informative, enlightening, and thought provoking, and will not be easily forgotten.